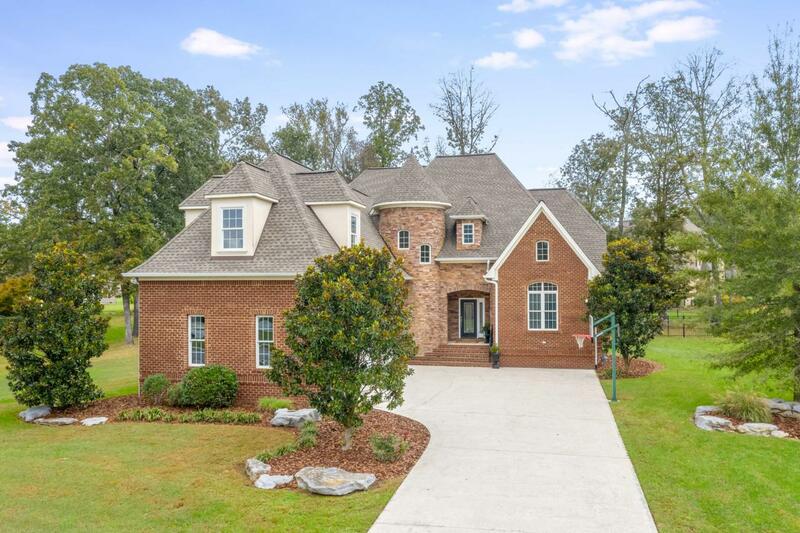 Presenting Ooltewah's Rambling Rose Drive situated in the well established Hampton Creek Community. It's easy to feel at home here in the gated community with a pool, tennis courts, clubhouse, 18 hole golf course, and sidewalks throughout. All of this located within minutes to the interstate, to the heart of the ever-growing Ooltewah, and a short minutes drive down Snow Hill Rd to the boat slip, and with only county taxes to pay! This home is nestled on over half an acre partially wooded lot lending privacy for the backyard oasis. The homes low maintenance exterior features brick with stone accent. A luxurious lifestyle awaits here with each room highlighting top of the line detail from the hardwood floors to the vaulted ceilings and built-ins.The iron chandelier and gleaming wood floors greet you in the grand foyer that opens to the great room on one side and the formal dining room to the left. The great room, kitchen, breakfast area, and dining room all flow from one into the next offering a Butler's Nook off the kitchen and dining making it easy to serve guests.The fireplace is the focal point of the great room featuring detailed trim and built-in entertainment center. Enter the breakfast area where a crystal chandelier awaits and french doors leading to the covered back patio. The kitchen is a chef's delight featuring custom cabinets with rope trim matching wooden hood over built in gas stove and pot filler above, a built-in china cabinetry, island with built-in microwave, 2 walk-in pantries, stainless appliances, granite countertops, double convection ovens, and tiled backsplash. The two story dining room features the hardwood and iron spiral staircase with a second story overlook. The Master on the main features vaulted ceilings adding to the already generous space with a seating area, an en-suite boasting Italian tile also surrounding the separate shower and jacuzzi tub, double vanity, and a his and her walk-in-closet. A half bath, study, and laundry room are also found on the main level. Upstairs the loft provides big enough space for a library or office. Upstairs also offers three additional bedrooms each with generous closet space, 2.5 baths and a large media/family room. The backyard oasis is fully fenced and offers some matured trees and a great spot for the fire pit. The covered back porch is equipped with fans and is great for outdoor entertaining and grilling out. This home is truly a dream come true checking off everything on the list. Must schedule a tour here today!